As one season ends, another begins, and Vermont’s resorts spend each season bettering themselves for the next. New this season, snowmaking upgrades have been made across the state. 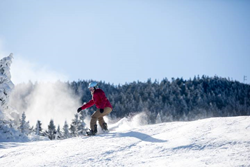 Investments like Mount Snow Resort’s $30 million-dollar West Lake Water Project, Bolton Valley’s expanded line of guns and hoses, Burke Mountain’s installation of 13,400 feet of new snowmaking pipe, and Stratton Mountain Resort’s switch to electric compressors, which resulted in a 40% decrease in diesel use, all continue to prove that Vermont’s resorts truly are at the forefront of sustainable and efficient resort practices.